BELIZE CITY–Belize’s sugar exports netted the country $30 million less in 2010—a year of major upheaval in the industry—than it did the year before, and indications are that the Belize economy lost millions in production and export earnings in the period spanning December 2013-January 2014, when the start of the crop year was delayed by almost two months. The country is grappling with a similar situation this year. In fact, the 2012/2013 sugarcane season was the last crop year to start early. It began on November 28, and according to information published by the Central Bank of Belize, deliveries up to the end of December 2012 were 40.2% higher than those of the corresponding period of the previous crop year. That crop year ended with Belize garnering $107. 4 million in sugar receipts from the export market. We were unable to get more current data on annual export earnings for sugar from our data sources. However, we were able to glean some information from monthly economic reports published by the Central Bank of Belize. These reports indicate that export receipts for December 2013 and January 2014 were nil because Belize could not export any sugar for those months. Meanwhile, earnings were down roughly 55% for the first two months of 2014, when compared with the same period the year before. 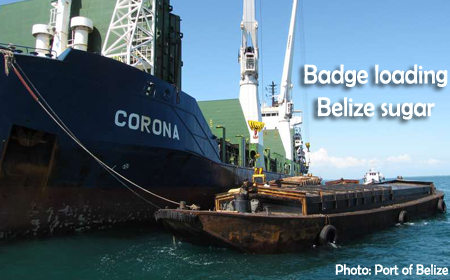 According to the official data, while Belize earned $17.3 million between January and February 2013, it earned a mere $7.8 million from January to February 2014, when the crop started late. Today, we could not get any official data on projected losses due to current delays in the start of the 2014-2015 crop, but it is clear that if the current situation persists, Belize could be reporting nil export earnings up to the end of January 2015, as it has for the past month, December 2014. We contacted the Central Bank to find out the extent of the country’s economic loss due to the delay in the sugar crop—the opening of which has been stalled for the past 5 weeks due to an impasse between farmers, under the umbrella of the Belize Sugar Cane Farmers’ Association, and the miller, the Belize Sugar Industry (BSI), a subsidiary of American Sugar Refining (ASR)—but they told us that the question is a tough one to answer. In a reply to our question this evening, Central Bank Governor Glenford Ysaguirre said that there are many factors that can affect sugarcane production and quality, and hence determine what Belize actually earns from the domestic export. Belize does earn substantial foreign exchange from sugar, but Ysaguire explained that foreign exchange losses would depend on the amount of sugar that would not be ground because of the late start to the crop. This, he said, would depend on the length of the grinding season. However, the length of the grinding season is dependent on the weather and the amount of sugarcane in the fields. According to the Governor, the Sugarcane Production Committee estimates 1.4 million long tons of sugarcane for the crop year, but BSI estimates 1.1 million long tons. “There is also a question about whether BSI has the existing capacity to grind 1.4 million tons of sugarcane, as it is unknown if BSI/ASR did any material factory expansion to accommodate a larger crop,” he explained. Artemio Osorio, Budget Director in the Ministry of Finance, said that the impacts of the delay on government revenues are not as substantial as the impacts on Belize’s balance of payments position. He indicated, though, that the delay would erode government’s foreign reserves, but added that reserves netted from the sale of Venezuelan fuel under the PetroCaribe initiative would help to buttress Belize’s economic stance. According to Osorio, the cañeros mostly don’t pay income tax and BSI, under its new ownership, has been granted a range of tax-exemptions. Ysaguirre said that export tax on sugar is BZ$11 per ton and this goes to fund the Sugarcane Industry Control Board, but the government doesn’t really get any other direct receipts. The Central Bank’s economic report said that the 2013/2014 crop year, one of those low years, commenced on 24 January 2014, approximately two months after the customary start date of operations. It noted that incessant rainfall had prevented harvesting and damaged delivery roads. At the same time, farmers and the factory remained at loggerheads over bagasse payments, which, after extensive negotiations, are enshrined in the new draft contract which the company wants the farmers to sign in order for the new crop year to commence. “For the 2013/2014 crop year, the Sugarcane Farmers Association determinedly pushed the issue of payment for bagasse and threatened that deliveries to the processor would only commence after agreement on payment was reached. With adverse weather pushing the opening of the crop into January, both parties eventually agreed that the bagasse negotiations should not cause additional delay to the harvest,” the Central Bank report noted. “Consequently, with only eight days of operations in January, deliveries for the crop year were down to just 54,726 long tons versus 386,132 long tons in the comparable period of last year [2012/2013],” said the report, adding that the low production was exacerbated by lower sugar quality caused by the rains. “During the month, there were no exports of sugar and molasses due to insufficient export volume,” the Central Bank report said. 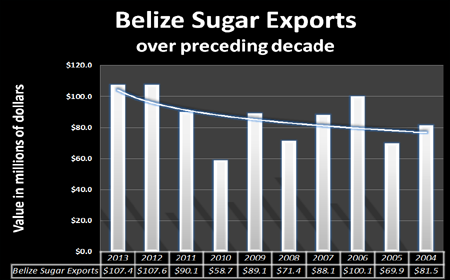 In January 2012, Belize’s sugar exports netted the economy $8.4 million, but that figure fell to $1.3 million in January 2013 – a decline of over 80%. For the years 2012-2013, the country’s annual export earnings from sugar stood at $107.5 million, up from $90 million in 2011 and $59 million in 2010, when the industry faced substantial delays due to problems with bringing the bagasse cogeneration facility online at BSI. Although BSI had promised to catch up on milling, the delay meant a loss in cane quality and lower production of sugar from the cane supply. Cane farmers had claimed a loss in January 2010 of roughly $4 million. In late 2010, the Government had to disburse a $10 million bailout loan to BSI in order for the company to meet third payment obligations to cane farmers. The 19% dip in sugar receipts in 2008 were due to major flooding, which affected cane quality and production.